The Snail-of-happiness flock now comprises four hens: the oldies – Lorna and Esme; and the newbies – Perdy and Aliss. Our original idea was to separate them during the day, with newbies in the run and oldies free to roam the garden as usual. Then to put them all together at night when everyone was sleepy. This worked fine on the first day in the sunshine. However, since then winter seems to have arrived and free access to the garden was inappropriate as there was so much standing water. Also, all of them needed to be indoors quite early because the rain was so heavy the water was soaking them to the skin (very unusual, they usually only get superficially wet). Unfortunately when they were placed together in the hen-house there was an unseemly scuffle! Newbies ended up sleeping in the shed. To alleviate some of the stress we decided to construct a new house using assorted stuff from around the house. 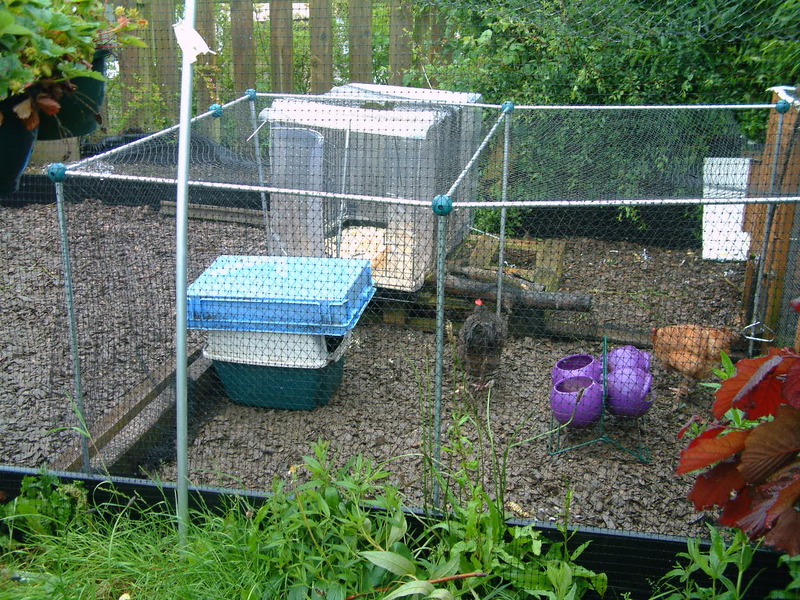 We now have a second hen-house made of a large dog crate and some heavy-duty plastic carpet protector, held together with cable ties and with a perch made from a piece of old skirting board. You see, I knew being a squirrel would come in useful eventually. This, currently is Aliss and Perdy’s house, although the picture shows it with Lorna and Esme just after we put it in position. Eventually it will be home to all of them as it’s bigger than the original hen-house, unlikely to support the dreaded red mites and will not rot. Also, because it’s a dog crate, it will be completely fox-proof. It’s currently sitting on a pallet, but we will raise it higher to provide additional shelter underneath. I guess that eventually we’ll just have to let them sort it out amongst themselves, but for the time being they are separated by mesh and sleeping separately. I have been advised that if we had a cockerel, he’d probably help to keep the peace, which might be true with respect to the hens but not, I suspect, with our human neighbours. However, the interactions are fascinating and despite all the disturbance the new arrivals have caused the oldies are still laying… so we had boiled eggs for lunch and I’ve made cup cakes. Oh yes, eggs, that’s why we have them, not entertainment! I LOVE that you have named the chooks after Terry Pratchetts witches! That has made my day 😀 Granny Weatherwax is my favourite, it sounds like Esme is just as bossy as her namesake. She really is… and she has the piercing blue eyes too. Perhaps she’s just trying to live up to the image. I should say that Lorna was named by Mr Snail – she’s a Calder Ranger and he chose the name so that she would be the ‘Lorna Ranger’. Tenuous if you ask me; he has been banned from further chicken naming until I have run out of witches! Yes, very tenuous 😉 A friend used to have chooks with names like Honey Mustard, Teriyaki, Sesame, all delicious chicken dishes. No, none of the chooks were ever eaten but if they knew what their names really meant…..
Hi, We had this problem but the rooster sorted it out, eventually. That is why it is called a pecking order. I think your idea of putting them side by side is a good one. Get’s them used to the sight of each other before letting them duke it out. I am afraid some skermish is inevitable. Finally, it got dry enough to let them roam free and with the extra space the argy-bargy diminished, There are still occasional scuffles, but generally the hierarchy has been established with Esme at the top and Alice at the bottom – what a relief!